imprisoned hood in an attempt to locate his mob and loot. Filmed At: Screen Gems Studios 7 and 10, Hollywood, CA. Rerun Date: Not rerun until syndicated in September 1975!!! Teleplay by Gerald Gardner & Dee Caruso and Dave Evans; Story by Dave Evans. �Mary, Mary� Written & Produced by Michael Nesmith. �The Kind Of Girl I Could Love� Written by Michael Nesmith & Roger Atkins; Produced by Michael Nesmith. Micky parks The Monkeemobile and is approached by a hood named Tony Ferano while in a parking lot who seems to mistake him for someone else. Then Tony acts afraid of Micky and begins to attack him with a rolled up newspaper.After the assault, Michael persuades Micky to report it to the police but at the police station, the police captain also mistakes Micky for someone else until Michael explains who he is. Then the captain shows them a picture of Baby Face Morales, the most vicious killer in America, who's a dead ringer for Micky. He explains that Baby Face is in prison but his mob is still at large and the loot they stole is still uncovered, and he wants Micky to impersonate Baby Face to get both the thugs and the loot. Micky refuses at first but the Captain warns him of the many enemies Baby Face has on the outside and Micky could get hurt with a face like his. Micky isn't convinced until leaves the station and Tony and his gang triggers a drive-by shooting with Micky as the target, which he narrowly escapes and zooms back into the station and changes his mind. First, he has to learn Baby Face's mannerisms so he visits Baby Face in prison claiming to be a cousin from Ohio who's been trying to follow in his footsteps. Baby Face then shows him his moves and his speech but Micky ends up being nearly strangled by Baby Face when he inadvertently hits him while trying to impersonate him. The Captain then tells him to go to the local hangout called The Purple Pelican where Baby Face's gang frequents to find out where the loot is. He shows him photographs of the other gang members and gives information about them: Tony Ferano and Mugsy Ruckyzer. At The Purple Pelican, Micky is confronted by Ruby, an aging showgirl who doubles as Baby Face�s moll. Thinking he's Baby Face, she warns him that Tony is now the boss since he's been gone and may not want to let him back in the gang. Micky, convinced he can trust her, produces a key for a locker at a bus depot containing a book with names and dates to give to Ruby, just before Tony, Mugsy and Vince show up. Tony insists that Baby Face won�t get back in the mob, calling him a �has-been,� to which Mick replies, �No, Tony, I was a has-been; now I�m an am-is!� Soon a bar fight erupts to the tune of �The Kind Of Girl I Could Love� which ends up with a pile of barflies all over the floor, either unconscious or badly bruised, save Micky and the gang. Tony, Vince and Mugsy decide to let Baby Face back in after all and head for the back room but Micky ends up going into the ladies room by mistake! At a meeting in the back room, Micky tells Tony, Vince and Muggsy that they�re going after the DeWitt diamonds, dividing them, and going undercover, and he�s rounding up a few specialists to help them. Tony gets suspicious when Micky nearly blows it by not remembering their regular meeting place and almost forgetting his name, and he decides to tail him. At The Monkees pad, Micky's on the phone with The Captain asking to rendezvous with the two specialists to aid him since he doesn't want to involve Peter and Michael, who offer to help. Just then, Tony and the mob show up at their front door and browbeats Micky into picking up the diamonds right away. Thinking Michael and Peter are specialists, they drag them along, too.After they all depart for the site of the jewelry stash, the phone rings from The Captain who is unable to warn Micky that the real Baby Face just broke jail. 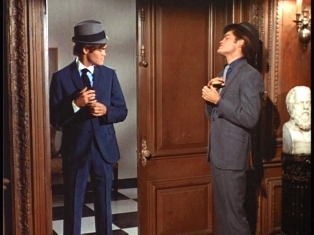 Arriving at The Purple Pelican, Baby Face greets Ruby who questions him regarding being out with Tony and the gang to pick up the diamonds, and, concerned for his ill-gotten gains, he rushes out in pursuit of his mob. Meanwhile at the Dewitt place, the gang tries to get Micky to remember which stone in the fireplace he hid the diamonds behind. Michael and Peter come up with a plan by planting dynamite in the fireplace and try to blow it up, but wind up blowing up the piano behind them instead. Annoyed by their incompetence, Tony has Mugsy and Vince use a crowbar to drill through the rubble instead. They are halted when a policeman shows up, and everyone hides except Michael who nervously confronts the cop and tries to allay him. Just as it seems that the cop is suspicious, it turns out he only wants to sell Michael tickets for a Policeman�s Ball for $20 and he buys the whole batch. After the cop leaves, the guys continue taking apart the fireplace, and just as the gang find a box containing the gems, Baby Face shows up. Micky tries to continue the pretense that he�s the real Baby Face when the gang questions both of them on a job they did in order to expose the imposter, but Peter mistakenly reveals Micky�s identity and soon the lights are out as a mad chase around the room ensues. David Jones explains his reason for being an absentee from this segment: he went to England to attend his sister�s wedding�which he missed by 48 hours. For the first and only time on The Monkees TV series, actual mention of a Monkees episode title is made. A reference to Steve Blauner is made in this episode. Blauner was one of the behind-the-scenes consultants on The Monkees TV series; he later executive-produced the ill-fated 1987 syndicated revival, The New Monkees. A second reference to him is made in Episode No. 42, "The Wild Monkees", in which Henry "Mr. Babbitt" Corden portrays the proprietor of The Henry Cabot Lodge And Cemetery (where the boys book for lodgings), Mr. Blauner. �The Kind Of Girl I Could Love� is featured here in its mix heard on the mono More Of The Monkees LP; an earlier appearance of the song, Episode No. 5, �The Spy Who Came In From The Cool,� featured it in an alternate version which fades a minute longer. Furthermore, the end credits for �The Spy Who Came In From The Cool� featured only Michael Nesmith as �The Kind Of Girl I Could Love�'s lyricist and Tommy Boyce & Bobby Hart as its producers, even though he produced it himself and composed it with Roger Atkins. The record is set straight in �Alias Micky Dolenz's� end title song listing. This is the first of 4 episodes of The Monkees to feature a missing Monkee; Michael Nesmith, as we know, would shine on 3 second-season segments (more on that later). Of the four original Monkees, Peter Tork and Micky Dolenz are the only ones to participate in all 58 TV episodes; towards the end of the second season, Peter and Micky were each allowed to direct an episode of the series, as part of an arrangement made during preliminary meetings for their upcoming feature film HEAD. An unused clip from �Alias Micky Dolenz� featuring Michael on the front steps of the police station clapping for joy can be seen towards the end of the second season opening for The Monkees. 4 days after �Alias Micky Dolenz� wrapped, The Monkees took to the road to begin their first full-fledged, full-blown concert tour, which played for 12 cities. They would divide their valuable time between filming and playing concerts; one concert, a January 21, 1967 set in Phoenix, AZ, was a combination of the two, as footage of the boys playing in The Coliseum was filmed for Episode No. 32, �The Monkees On Tour�, The Monkees TV series' first season finale. In �Alias Micky Dolenz�'s original script, The Captain is given a surname of Hargrave. In the scene where The Monkees, Tony, Vince and Muggsy venture into the DeWitt home, take close notice of the shadow of a sound boom microphone hovering above them! �Alias Micky Dolenz�'s original Screen Gems Storyline features a deleted segue in which Micky trained the other Monkees in the fine arts of mayhem, prior to using them as his "specialists". �Alias Micky Dolenz� was one of 4 Monkees episodes to be dubbed from substandard-quality 16mm film prints for use in the syndication package by Colex Enterprises in 1986 (the other 3 were No. 10, �Here Come The Monkees� [Original Pilot Film], No. 32, �The Monkees On Tour� [from the CBS Saturday Afternoon run], and No. 54, "The Monkees In Paris" [a.k.a. "The Paris Show"]); obviously, the original 33mm film interpositives to these segments couldn't be located in time for them to be restored. In 1995, for the release of the Rhino Monkees Deluxe Limited Edition Box Set [R3 2960], the interpositives to these shows were finally discovered for their restoration; the lone exception being "The Monkees In Paris"; the upgraded print of �Alias Micky Dolenz� has been adapted into the syndication package. Bulletin: Until recently, the theory was that "The Monkees In Paris" was shot in 16mm only, and as a consequence, no 35mm master existed...until a 35mm print of "The Monkees In Paris" surprisingly surfaced, and a newly digitized version of the episode is currently a part of Comcast OnDemand. This episode, ironically, aired 2 days before Micky Dolenz's 22nd birthday on March 8, 1967...which, simultaneously, saw the release of �A Little Bit Me, A Little Bit You� b/w �The Girl I Knew Somewhere� as The Monkees' 3rd single (Colgems #1004). �Alias Micky Dolenz� is yet another Monkees episode that was passed up for Saturday Afternoon repeats on CBS and ABC (probably due to their Broadcast Standards & Practices objecting to the barfight scene). Strangely, since this was its only airing on NBC in prime time, it would be 8 years before this episode was even seen again since its first telecast! Baby Face Morales is named after Lester Joseph Gillis, a.k.a. George "Babyface" Nelson (December 6, 1908�November 27, 1934), dimunitive 1930s bank robber. A 1957 United Artists movie based on his life starred in the title role Mickey Rooney, whose son, Mickey Jr., auditioned for The Monkees in 1965; it also co-starred pre-Monkee guests John Hoyt (�I Was A Teenage Monster�) and Ted DeCorsia ("Hitting The High Seas", "The Devil And Peter Tork"). The surname "Fingerhead" is used for the second time on The Monkees in �Alias Micky Dolenz�; the first was in the previous episode, �Monkees A La Mode�. Right after panickly reentering the police station after dodging Tony's drive-by shooting, Micky is seen pantomiming use of a Thompson submachine gun. This is the first instance of Micky pretending to use a gun; in the interview segment of Episode No. 35, "Everywhere A Sheik Sheik", he uses his drumstick to pretend to shoot in the sky; at the end of No. 48, "Fairy Tale", as The Monkees sing their theme song, Micky pretends to shoot with a crossbow; and he is also seen preending to shoot in the tag sequence of No. 49, "The Monkees Watch Their Feet". In his encounter with Baby Face Morales in jail, Micky claims he's from Sandusky, OH -- when he's really from Burbank, CA, as he revealed to Chic magazine reporter Miss Dilessips in �Monkees A La Mode��. Tony Ferano's aliases: Big Tony, Tony The Rock, Tony The Slasher, Kissing Clyde. We learn he had been a cop before joining up with Baby Face. Muggsy Ruckyzer's aliases: Muggsy Ruck, Muggsy Reynolds, Muggsy Raymond, Sherry Fingerhead. Both Muggsy and Tony hail from Detroit, Michigan. The licence plate on The Monkeemobile: NPH 623. Michael Nesmith is wearing his blue hat in the �Mary, Mary� sequence. The number was filmed during production of Episode No. 27, �Monkee Mother�. In the scene where The Captain shows Micky the mugshots of Tony and Muggsy, notice that Micky is wearing the shirt worn by Michael on the cover of the More Of The Monkees album. The late Robert Strauss (Captain) was previously seen as Sergeant Stan Gruzewsky on Mona McCluskey (NBC, 1965-66). Maureen Arthur (Ruby) was a regular on the TV series Tonight, which ended up becoming The Tonight Show. Arthur was the host on Mondays and Tuesdays. Don Sherman (Policeman) played Andy in the films Rocky III (MGM/UA, 1982) and Rocky V (United Artists, 1990); he also played a bartender in the first Rocky film. Sherman appears on The Monkees again in Episode No. 40, "Monkees Marooned", as sly con artist Leonard Sheldon. Mike Wagner (Vince) played Malden on Camp Runamuck (NBC, 1965-66), which also starred Monkee guest actor Arch Johnson (�The Chaperone�), and featured the same sound effects as heard on I Dream Of Jeannie (NBC, 1965-70) and The Monkees.